If hearing loss prevention efforts are to be successful, it is important to know that hearing protectors are reducing noise to safe levels. While a properly administered Hearing Protector Fitting helps to ensure that employees are achieving the best possible fit from an appropriate hearing protection device (HPD), the fit check system takes this effort even further. Traditionally, industry has had no choice but to look to the often criticized Noise Reduction Rating (NRR) as an estimate of the attenuation provided by hearing protectors. Both industry and hearing conservation professionals have long desired a means to reliably predict individual, real-world noise reduction values. With the modern technology of the fit check system, this objective means of measurement is now possible. 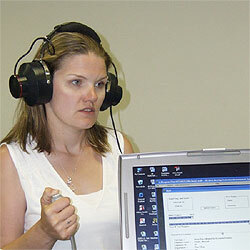 Employees are tested both before and after putting on their hearing protection. PAR can be subtracted directly from noise exposure level to determine an employee’s protected exposure level.